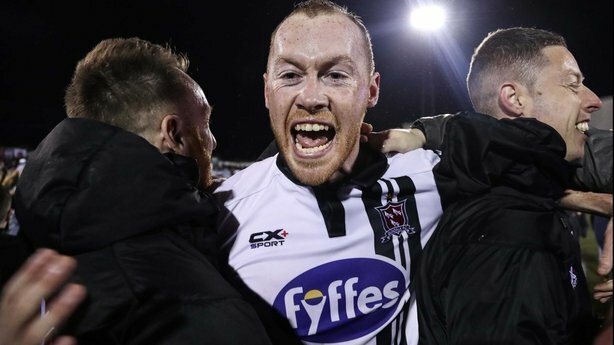 Brian Gartland popped up with yet another vital goal as Dundalk overcame Bohemians 2-1 to secure their third SSE Airtricity League Premier Division title on the trot at Oriel Park. Captain Andy Boyle put Stephen Kenny’s side in front after a quarter of an hour with his third league goal of the season but they were pegged back before half-time when former Lilywhite Mark Quigley scored a contentious penalty. But Gartland, who also scored in the 2014 title decider against Cork City, ensured the league trophy will remain in the northeast for another 12 months at least when he slammed home the winner in the 63rd minute. The result moves the Lilywhites seven points ahead of Cork City with just two games to play, confirming Dundalk as league champions for the 12th time in their history. Bohs arrived looking to put the champagne on ice and, if anybody could do it, it was the Gypsies, who were the only team to beat Dundalk in a league game at their own ground in 2015. Kenny made three changes to the side that was beaten by Zenit St Petersburg in the Europa League three nights earlier, with Gary Rogers recalled in place of Gabriel Sava between the posts. Elsewhere, John Mountney and Alan Keane came in for Robbie Benson and Sean Gannon. Oriel Park was rocking even before the teams appeared but the visitors did a good job of lowering the decibel levels by knocking the ball about with confidence in the opening stages. Dundalk, however, opened up and they fashioned their first opening in the 12th minute. 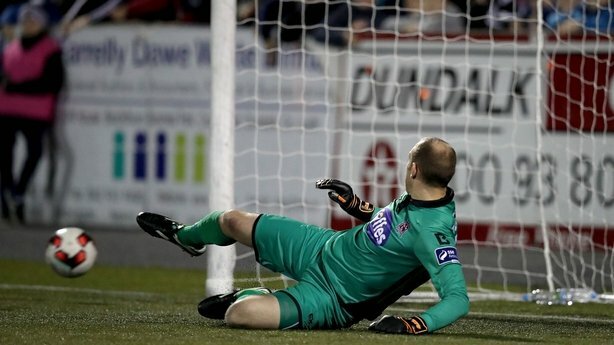 Daryl Horgan picked out David McMillan at the back post but Shane Supple did enough to stop the striker’s header. Ronan Finn forced his way through a couple of challenges two minutes later but his shot was deflected wide for a corner and Dundalk made the early breakthrough they would have wanted from the resulting set-piece. McEleney, looking to win his first league medal, fired over a corner from the left that just evaded McMillan but Boyle rushed in to power home a close-range volley. It looked like the title party had started, but Bohs regained their composure and ex-Dundalk striker Kurtis Byrne fizzed an effort over the top after Dean O’Halloran robbed Chris Shields. And the home support was stunned into silence in the 29th minute when Bohs restored parity in controversial fashion. Referee Neil Doyle ruled that Ronan Finn’s hanging leg caught Keith Buckley’s shin. Replays showed that the Dundalk player didn’t make any contact but Mark Quigley stepped up to casually send Rogers the wrong way from 12 yards. Dundalk upped the tempo again just before the break and Finn lifted a good opportunity over the top after an incisive pass by McMillan cut the Bohs back four open. Supple then parried a devilish McEleney cross - that was just crying out to be converted - away to safety and the teams went in level at the interval. The natives tried to get on the front foot at the beginning of the second half, with Alan Keane making space to pick out Horgan with a cross, but the little winger couldn’t keep his header on target. However, Keith Long’s side continued to pose a threat and Boyle was fortunate to get away with a late tackle on Derek Pender inside his six-yard box. Kenny introduced Robbie Benson for John Mountney in the 55th minute and the midfielder almost put Dundalk in front three minutes later. Horgan’s deep cross from the left was touched onto the crossbar by Supple, with Benson sending an overhead kick just wide from the rebound. 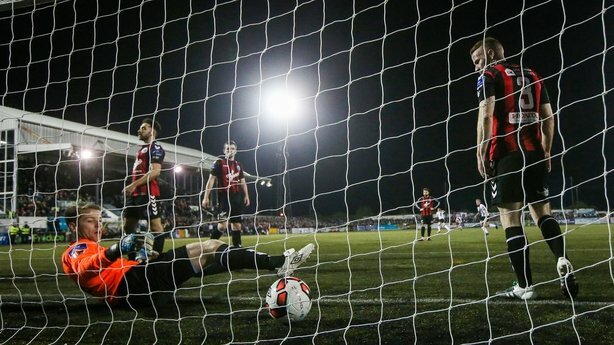 The majority of the 4,637 in attendance sensed another Dundalk goal and it arrived with 63 minutes on the clock to clinch the title. Ronan Finn’s free-kick from the halfway line sought out Massey on the left and he rose brilliantly to head across goal for Gartland to turn home his seventh - and most important goal - of the season.